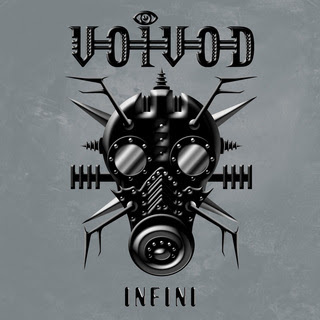 Stay Right Here a Little While...: TWO PREVIEW TRACKS AVAILABLE FROM VOIVOD'S FORTHCOMING "INFINI"
TWO PREVIEW TRACKS AVAILABLE FROM VOIVOD'S FORTHCOMING "INFINI"
There are two preview tracks available to Voivod's new album "Infini", to be released on June 23. They are incredible sounding. Quintessential Voivod....futuristic cyber metal at it's best. The sound is along the lines of their last two releases, with a little more emphasis on dissonance and bizarre, cybernetic chords. This album features the last written and recorded efforts of their deceased gutiarist Piggy, the driving musical force behind the band. To listen to the two songs, "Earthache" and "Global Warming", click here. They are the first two songs on the player. I can't wait until "Infini" is released. Gotta get my Voivod fix. To read a little more about Infini, click here.